They were called Argonauts, forty-niners, crazy. For ten years thousands of intrepid young men from the east thronged westward to an almost mythical land called California in search of the heavy yellow metal. The economy of the young United States was depressed following the Mexican War and the Gold Rush was just the stimulant needed. 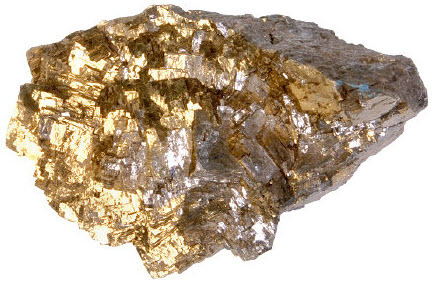 While millions of dollars worth of gold were found in the early years, the exaggerated claims left many open to bitter disappointment. One young man, thinking himself less gullible than most, declared "If I don't pick up more than a hatful of gold a day, I shall be perfectly satisfied." 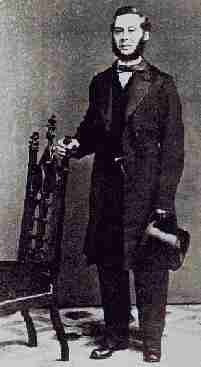 It was in 1847 that John Augustus Sutter, a Swiss entrepreneur, became partners with James Marshall. 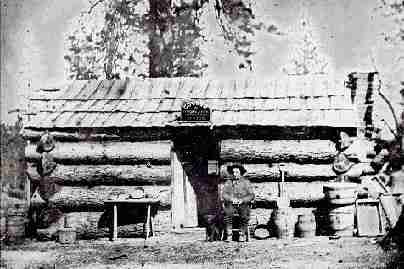 In a pine forest along the American River in northern California, Marshall was busily constructing a sawmill to provide lumber for Sutter's many projects. Inspecting the millrace early Monday morning, January 24th, 1847, Marshall noticed a glint of yellow in the silt washed down from the mountains. A few nuggets. After pounding it, boiling it in lye and baking soda, bathing it in nitric acid, and comparing its weight to silver, they were convinced it was real gold. 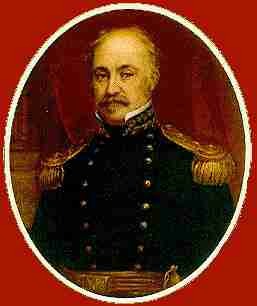 It took another year for the news to reach the eastern half of the country and, in December of 1848, President James K Polk confirmed it - gold had been discovered in California. 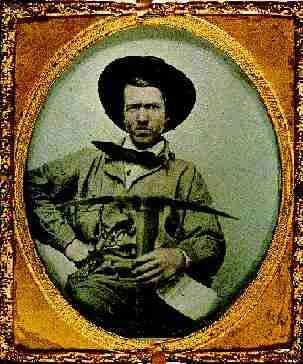 Despite discovering gold, James Marshall never made a penny in the diggin's. One of the many how-to pamphlets for would-be Argonauts. 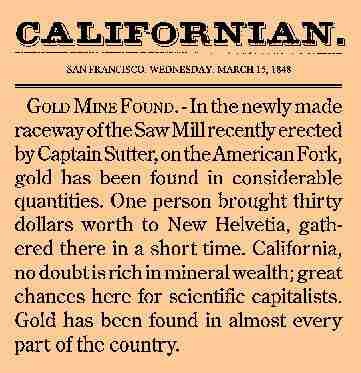 An early newspaper clipping announcing the discovery of gold in California. 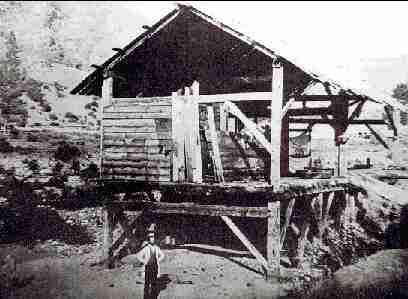 The first step for most would-be miners would be crossing the three thousand or so miles between where they were and where the gold was. 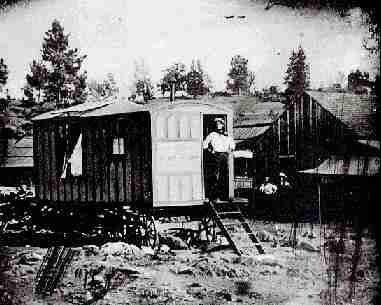 Many simply hitched up the wagon and traveled overland. A straightforward enough journey until one got past the Mississippi River, after which loomed an uninhabited, uncharted, unknown wilderness. Dust storms, snow storms, mysterious Indians, and arid desert awaited. For those on the eastern seaboard, a logical alternative was by sea. 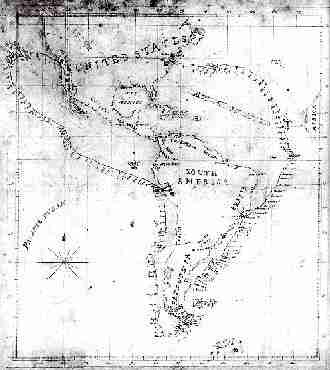 The 13,000 mile pilgrimage around South America via Cape Horn could consume over a year and entail sea-sickness, scurvy, and, worst of all, monotony. 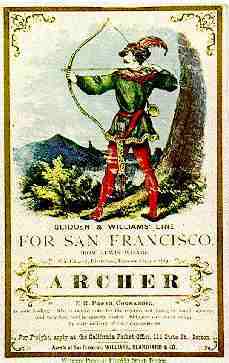 A broadside advertising the Archer - Elegant, First Class, and very fast. 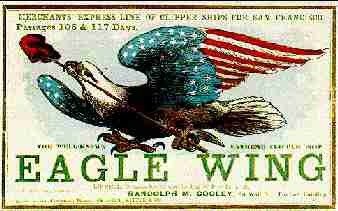 The Extreme Clipper Ship Eagle Wing, its record time - only 106 days. 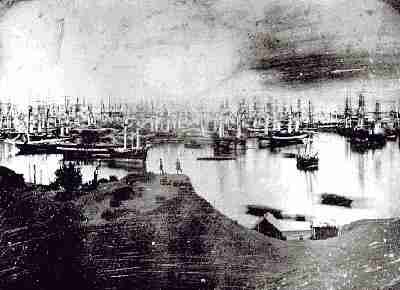 So many ships packed the harbor at San Francisco. Many newspapers lampooned the hysteria of the fourty-niners. A map showing the route of the Apollo carying an early batch of miners. 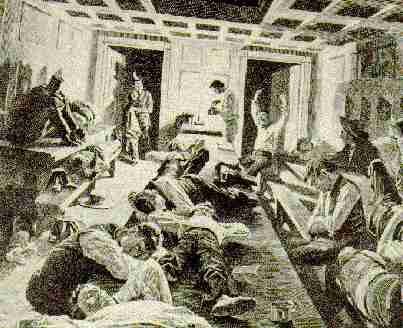 Life aboard the ships frequently entailed long hours belowdecks seasick. 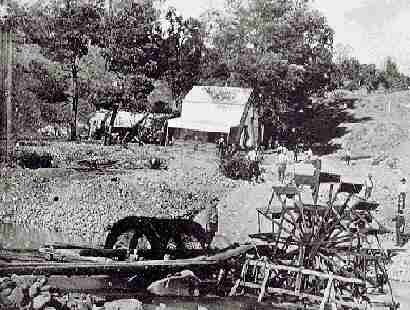 At the outset of the gold rush, there were indeed nuggets just glittering on the banks of rivers and streams. This bounty was swiftly consumed; thereafter the precious metal had to be extracted from ever increasing quantities of dirt, mud, sand, and rocks. The task involved back-breaking labor leavened with heavy doses of disappointment. The simplest tool was the simple wash pan. Start with a pan of loose dirt and icy mountain water - swish it around in a circular motion letting some of the dirt slop out the edges. The gold, being heavier, eventually settles to the bottom. Repeat this procedure all day long, every day. As time went on, new-fangled devices were created. These included the cradle, long tom, and sluice box. They could process more dirt - but they were just as much work. A complicated mining rig at Horseshoe Bar on the north fork of the American River. A lazy afternoon on Main Street in a mining town in 1852. 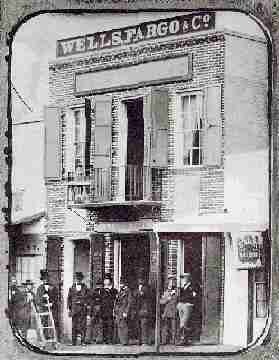 The Wells Fargo Bank in San Francisco, 1852. 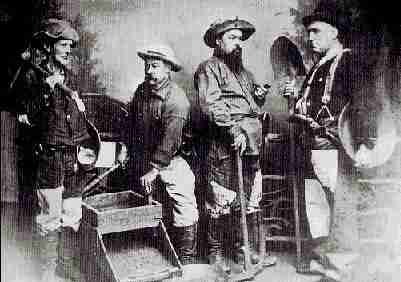 A group of miners displaying the tools of their trade: pan, cradle, and long-tom. 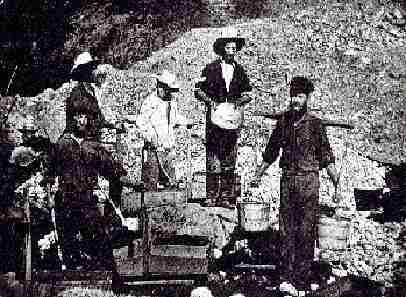 Gold mining near Grizzley Flat about 1853. 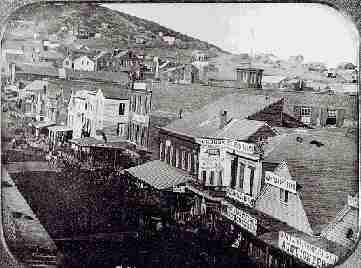 The busy marketplace on Montgomery Street in 1850. 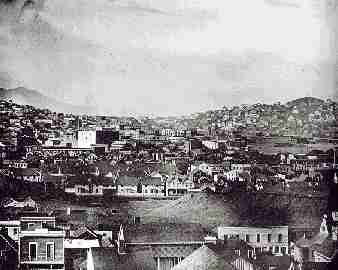 By 1855, the city of San Francisco's population had passed 55,000. 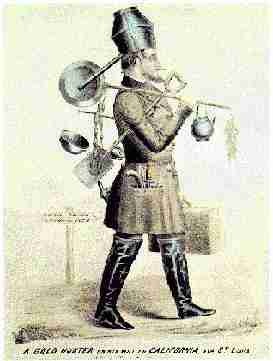 After a wet, weary week with a wash-pan, even the most ardent argonaut needs to stand up, stretch a bit, and head into town for supplies: flour, bacon, beans, salt, and coffee. In profitable areas, shopkeepers frequently expanded their services beyond mere necessities. Some even sported a small library. 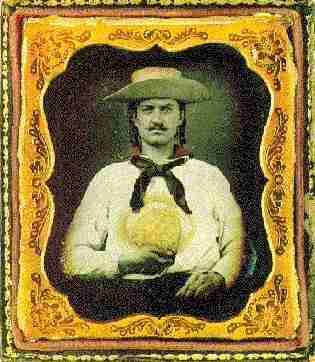 Card games, such as three-card monte, and ardent spirits were always popular methods of disposing of extra nuggets. 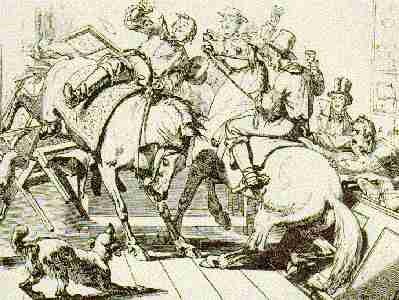 Bar-room brawls and public hangings were perennial favorites. And as civilization encroached, traveling entertainers, road shows and even the Circus came to town. A pair of miners have overindulged and ridden into the shop - but they haven't spilled a drop. 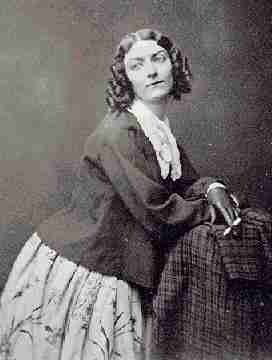 Lola Montez was famous in Europe, but her dancing and acting was so bad she was laughed off the stage. Helen Western appears her in her costume for the play The French Spy. She's allegedly disguised as an Arab. 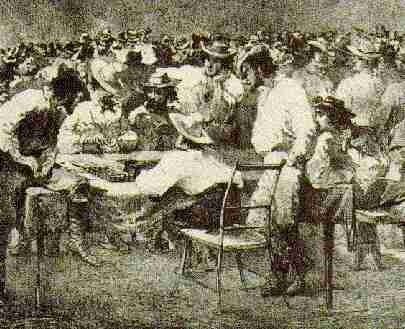 One could always count on finding a game of 3-card monte going in the saloons. 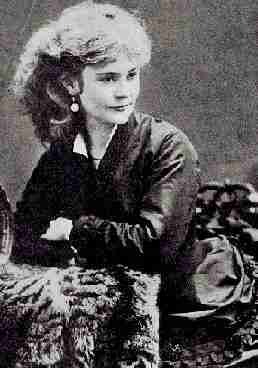 Mabel Santley and her Blond Burlesques toured the mining towns performing comedy and dancing. Lotta Crabtree started on the stage as a child star and went on to become America's most famous comedienne. As the cries of "Eureka!" became fewer - or in areas where there was more gold than common sense, many enterprising souls realized there were easier ways of acquiring gold than actually digging it out of the ground. Miners needed many things, and rich miners always seemed to need more things. 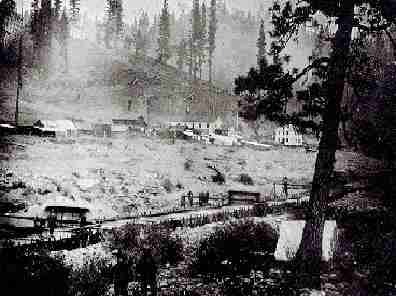 Collis Huntington spent one day in the diggins and decided to open a hardware store; Leland Stanford started with a grocery store in a mining camp, then became a partner in the railroad, then got himself elected Governor of California. 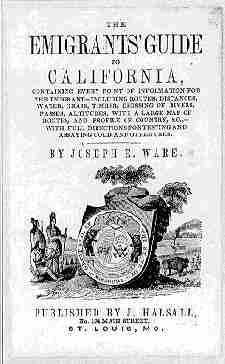 Sam Clemens, Bret Harte, and Ambrose Bierce made their fortunes writing for California newspapers. 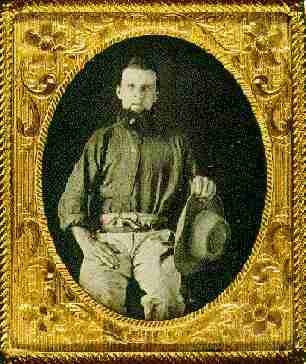 Isaac Baker made a better living photographing miners than most of his customers. 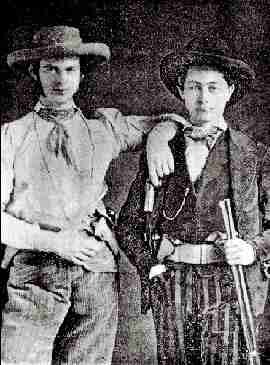 Levi Strauss made his fortune selling canvas trousers with patented riveted pockets to miners. Gold mining takes a lot of water. 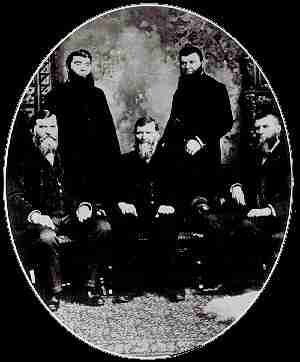 The Coyote and Deer Creek Water Company was one of the first suppliers. 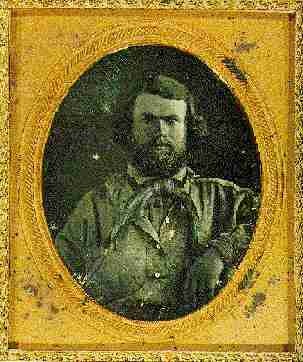 Philip D. Armour walked to California from New York. 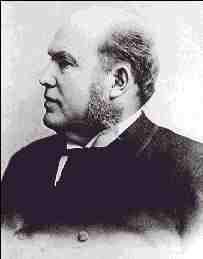 He opened a butcher shop which eventually became the largest meatpacking plant in the U.S.
Horace Greely, a journalist, was instrumental in spreading the news, saying "Go West,young man." 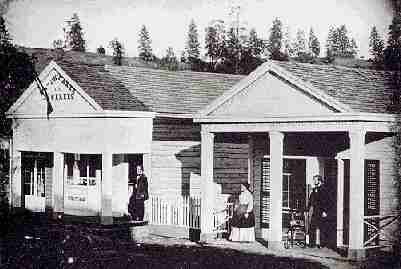 John Studebaker migrated to California in 1852; he built and sold wagons, eventually becoming America's largest carriage maker. 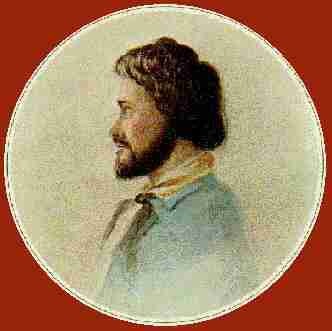 In January of 1839, Louis Jacques Mandé Daguerre announced to the Académie des Sciences in Paris his invention of photography. 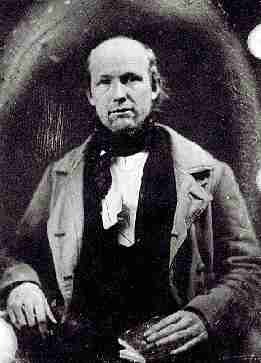 He called his pictures daguerreotypes. And when the miners headed west, the new art of photography went with them. 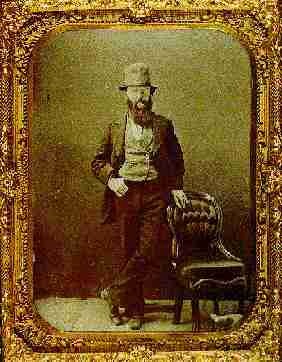 Many had their portraits taken before they left as mementoes for family left behind; others availed themselves of the services of itinerant photographers such as Batchelder's Daguerrian Saloon. It was, for many, their most vivid souvenir of their days of glory, no doubt, vivid illustrations to the tales told to their grandchildren.